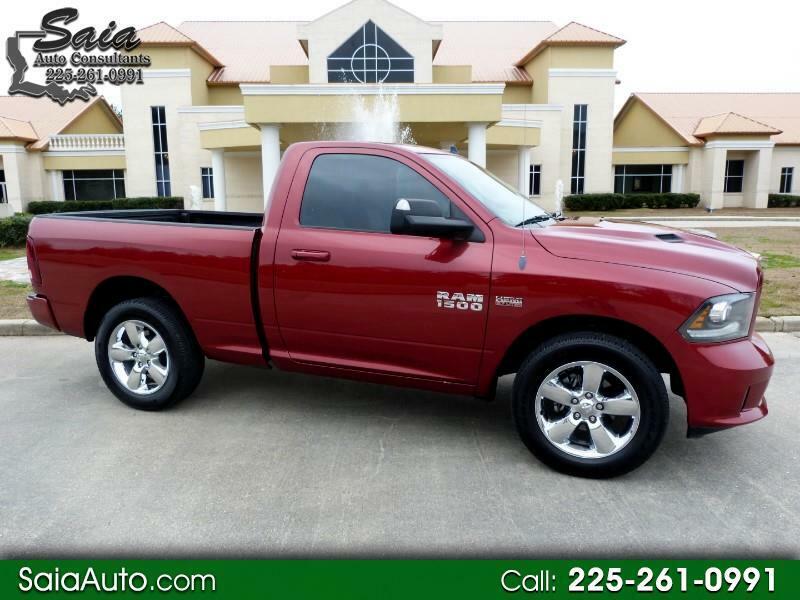 SAIA AUTO IS PROUD TO OFFER THIS 2014 RAM 1500 R/T SINGLE CAB HEMI V8 FINISHED IN FLAME RED CLEAR COAT OVER BLACK LEATHER INTERIOR. THIS NO ACCIDENT, ONE OWNER TRUCK HAS JUST ARRIVED AND HAS BEEN SERVICED, DETAILED AND IS READY TO GEAUX! OPTIONS INCLUDE: 5.7L V8 HEMI ENGINE, AUTOMATIC TRANSMISSION, 2 WHEEL DRIVE, POWER SEATS, HEATED SEATS, BUCKET SEATS WITH A FULL CONSOLE, HEATED STEERING WHEEL, STEERING WHEEL CONTROLS, SATELLITE READY STEREO WITH USB/SD CARD/AUX PORTS, ALPINE SOUND SYSTEM, BLUETOOTH, NAVIGATION, BEDLINER, BACK UP CAMERA, TOWING, 275/60R20 GOODYEAR WRANGLER SRA'S AND ALL OTHER STANDARD FACTORY OPTIONS. DON'T MISS OUT ON THIS VERY NICE TRUCK! CONTACT BLAKE SAIA AT 225-261-0991 OR BRAD SAIA AT 225-445-5320 WITH ANY QUESTIONS, CONCERNS OR OFFERS. VIEW OUR WEBSITE AT WWW.SAIAAUTO.COM THANK YOU FOR YOUR INTEREST! All vehicles are for sale locally!!! Just 4.1 miles from the Baton Rouge airport for our out of state customers!!! We strive for 100% feedback and happy customers!!! Financing available. Rates as low as 2.99%!!! Find and Like us on Facebook at Saia Auto Consultants to get an extra $100 off this truck!!! Visit Saia Auto Consultants LLC online at saiaauto.com to see more pictures of this vehicle or call us at 225-261-0991 today to schedule your test drive.